This begs the question though, should I change my cleavage protocol? In today’s post, I’ll evaluate several lengths of time used to cleave and fully deprotect an Arg-rich peptide sequence. Certainly synthesizing peptides rich in arginine can be a challenge, the challenge is further extended in the cleavage reaction. While the physical removal of a peptide from the resin is often rapid, it is well established that removing the Arg Pbf-protecting group can be more challenging. Incorporating multiple arginine residues into a peptide, particularly if they are close in linear sequence, can further compound this issue. I, and I’m sure many others of you out there, have purified a crude peptide only to find that a significant portion of the crude material contains the desired peptide with residual Pbf protecting group(s). So to figure this out, I synthesized a large batch of the TAT cell-penetrating peptide (GRKKRRQRRR-NH2) and divided the resin into 3 roughly equal portions. I then suspended the dry resin in cleavage cocktail (95:2.5:2.5 TFA:water:TIS) and stirred for 1, 2, or 3 hours. I chose to use a minimal volume of cleavage cocktail (3 mL for ~100 mg ChemMatrix® resin) to reduce the amount of TFA handling after the cleavage was completed. I decided to quickly analyze each of the cleaved peptide samples by directly injecting the crude mixture, dissolved in 1% HFBA (aq), onto my Isolera Dalton 2000. I did expect to see a significant number of masses, given that this peptide will ion pair with any negatively charged counterion to a significant extent, and was not disappointed. After some deconvolution though, I identified both my desired peptide and a des-Arg deletion sequence in the mixture subjected to cleavage for a full three hours, Figure 1. 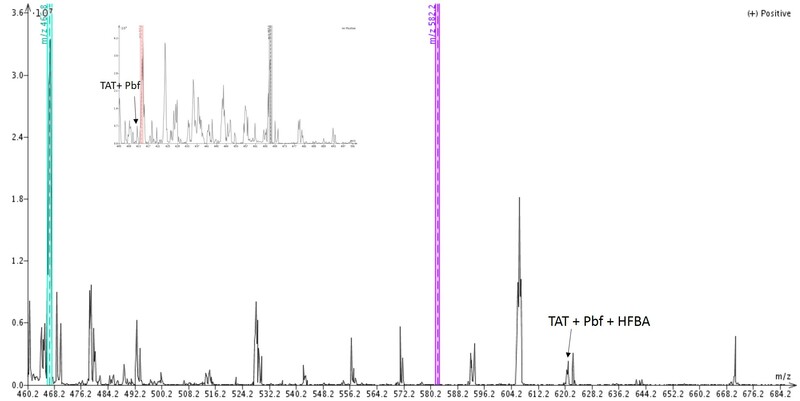 Figure 1: Mass spectrum of crude TAT peptide stirred with cleavage cocktail for 3 hours. Masses for Tat peptide and the des-Arg deletion sequence are highlighted. I identified though, peptide masses that correspond to either the desired TAT peptide or the des-Arg deletion sequence that still contain a Pbf protecting group after a single hour of the cleavage reaction, Figure 2. Figure 2. Mass spectrum of crude Tat peptide cleaved for only 1 hour. Masses assigned to peptides still containing a Pbf protecting group are indicated. Gratifyingly, the residual protecting group signal decreases below the level of detection as a function of cleavage reaction time (data not shown). I would have liked to see the parent peptide ion intensities grow, but using ion counts to measure concentration is not recommended, especially without an internal standard. You may notice however, that a molecular weight of 621 has been indicated and assigned to two different peptides. I have made the assigment after careful consideration of all three spectra. Interestingly, this mass is completely absent from the peptide cleaved for two hours. 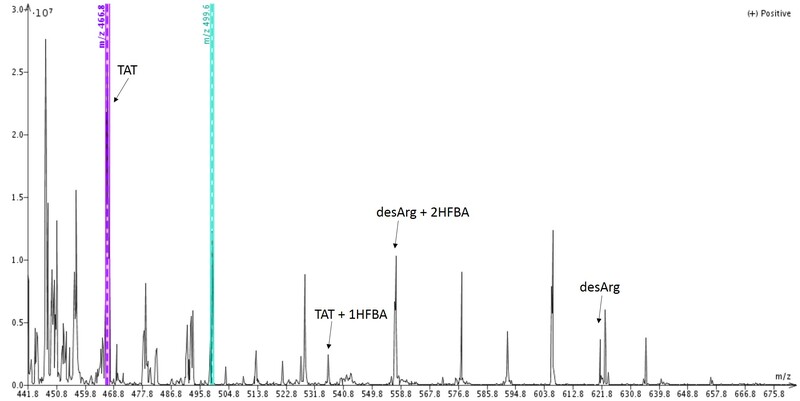 This suggests and equilibrium of sorts, where after only a short cleavage time residual Pbf-protected Tat peptide remains, and after a longer reaction time the unprotected des-Arg sequence is detected. If this mass represented a single species, I would have expected a consistent ion count across all injections (in the case of des-Arg) or a complete loss of signal all together (for protected Tat). With this information in hand, I’d recommend increasing your room temperature cleavage reaction time to a full three hours when cleaving peptides rich in arginine residues. An interesting alternative experiment is to increase the total cleavage cocktail volume or alter the additive composition. Maybe I’ll try those next! What strategy have you employed to ensure complete removal of Pbf protecting groups during peptide cleavage? I have had a lot of fun exploring these different challenges in the peptide space, but I know I have barely begun to scratch the surface. Please complete our survey and let me know if there’s anything you’d like to see discussed in the future. Previous Previous post: How does flow rate affect my peptide purification efficiency when using a small pore stationary phase?